We are leaving this page active for archival reference. Now you can issue highly secure, professional quality, genuine Polaroid all-photo ID Cards and ID Badges easier and with more reliability than ever before. Polaroid's Professional ID-4* conveniently delivers professional high quality full-color "all-photo" tamper-resistant horizontal format ID Cards or ID Badges, in no time at all, from anywhere you choose. Polaroid's ID-4 Instant Photo Identification System* combines compact, self contained styling with advanced operational features and reliability, making it one of the more convenient way to produce highly tamper-resistant PhotoSecure ID Cards or ID Badges. The Polaroid ID-4* quickly and effortlessly allows you to produce full-color professional quality ID Cards and/or ID Badges on the spot, within minutes, with a point-shoot-laminate ID System that can issue around 125 completely finished ID Cards or ID Badges cards per hour. Should you choose to change locations, the camera, power supply, diecutter and laminator are completely mobile and always ready-to-go. 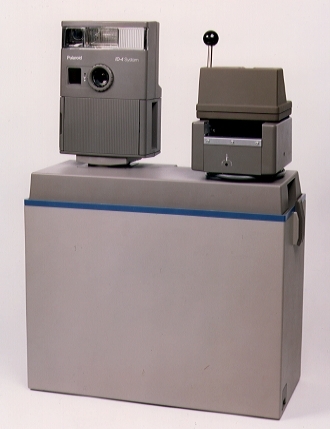 The Polaroid ID-4 produces an "all-photo" ID Card or ID Badge with portrait and specialized identifying subject data appearing on a single sheet of film. Almost anyone can operate the Polaroid ID-4* immediately, with little or no training. The ID-4 has been designed for optimum performance and reliability. The ID-4 incorporates sophisticated features to enhance picture-taking operations. The LED indicator panel guides the user through the card-making process, eliminating mistakes. The LED indicators light up as a reminder of the next step, and the ID-4 will not continue until the current step is fully complete. A sonar ranging aid automatically measures your distance from the subject, telling you if you are too close or too far for properly focused portraits. Electronic timers emit an audible tone when instant film development is complete. The visible aiming light ensures accurate portrait composition for clear, bright pictures every time. The face brightener feature allows you to make exposure adjustment for subjects with dark complexions to capture the most accurate image possible. The ID-4's laminator heats up, ready to use, in about 3 minutes. Both the laminator and die-cutter can be detached, allowing multiple operators to speed ID production. The ID-4's LED indicator panel guides you! The ID-4's LED indicator panel guides you through the card-making process. The ID-4 includes a keyswitch lock to assist in preventing unauthorized usage. Removing the validation plate renders the system inoperable. The non-resettable image usage counter helps monitor use of the ID System. You can choose to make one or two ID Cards! 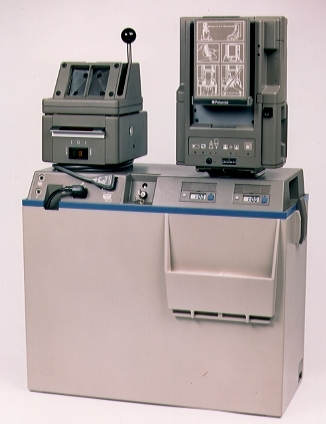 The ID-4* allows users to choose between taking two pictures of a single person, or two separate pictures of different persons on a single sheet of film. Generally, most users will choose to take two pictures of each person, use one for the ID Card or ID Badge, and place the second copy in the person's permanent reference file. The Polaroid ID-4 allows you to create horizontal wallet sized professional high security ID Cards or Badges which are fully compatible with most access-control systems. 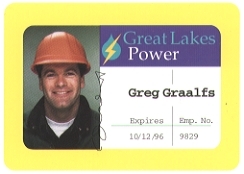 Generally, most ID pictures will be sealed inside a plastic pouch printed with additional information, or equipped with a magnetic stripe or other security feature. Also, a great many facilities now integrate Polaroid ID Cards and ID Badges with a building or campus wide proximity access control system. The Polaroid ID-4* produces an "all-photo" ID Card or ID Badge with portrait, signature and identifying data appearing on a single sheet of film. Not only is this more convenient, compared to "cut-and-paste" systems, it's also far more secure. 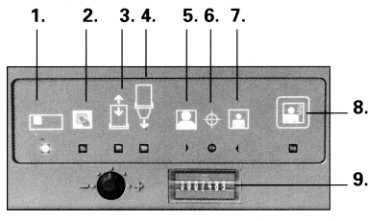 The individual being photographed and accompanying data are integrated together on a single film chip, enhancing security. In addition, with Polaroid PhotoSecure ID Cards, your Polaroid Film Chip and genuine Polaroid Laminate form a molecular bond. 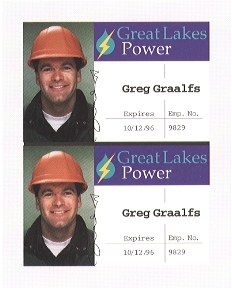 Attempts at tampering "photo-destruct" the card, making alteration immediately visible. 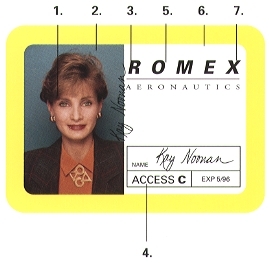 The sample ID Card below and the following feature listing, highlights Polaroid "all-photo" ID Card and ID Badge security features. The Polaroid ID-4 operates best with Polaroid Polacolor ID Ultraviolet film. Polacolor ID Ultraviolet Film is manufactured with an invisible security pattern printed right into the film. When this special film is exposed to any ultraviolet scanning light source, the pattern becomes instantly visible, and the pattern is virtually impossible to alter or forge. In addition, Polacolor ID Ultraviolet film also forms a virtually indestructible bond with Polaroid PolaSeal Laminates. The Polaroid ID-4 carries a one-year Polaroid warranty which includes all parts, service and repair.